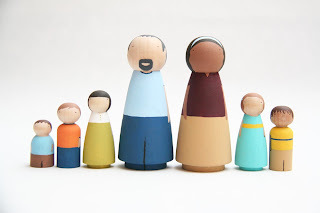 Mini Modern: Where Did You Get The Mike & Sheila Family? Where Did You Get The Mike & Sheila Family? I have gotten a few inquiries about the little wooden dolls that I have been using in the silly adventures of Mike & Sheila posts. They were made by one of my favorite artists--her name is Michelle and her Etsy shop is Goose Grease. I am an avid collector of her custom wooden dolls. I'm sure this comes as a great surprise that I collect things. I have a cabinet that is getting full of her work. She's bound toward fame--having had her doll creations featured in LMNOP magazine and soon on Martha Stewart's "The Art of Wedding Cakes 2" so if you want to order your own set, I would suggest doing so now. The customer service is excellent. The Goose Grease dolls are wooden and made with non-toxic paints and finishes. Michelle makes all kinds of character dolls, custom families to look like yours (or the one you wished you had) and wedding cake toppers. Below are a few examples of her fabulous work. I have to warn you that you won't be able to order just one. I've bookmarked her in Etsy. Thanks! And your photo stories with them always make me smile/laugh. Poor Sheila!